A printed thangka of Dukkar, also known as White Umbrella or Sitatapatra in Sanskrit. Dukkar is very beneficial for healing, protection from spirits and in legal situations. Dukkar in her full form is one of the most complex deities in the Tibetan Buddhist pantheon. 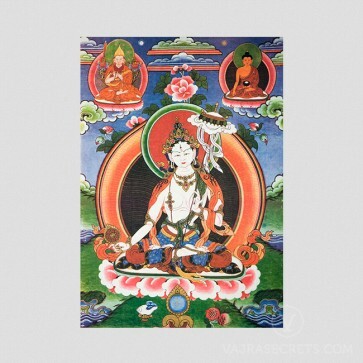 Also known as White Umbrella or Sitatapatra (Sanskrit), this printed thangka depicts Dukkar in her simplified two-armed form. She is white in colour with a slightly wrathful expression and is seated in the vajra position. Her left hand holds the handle of a white parasol unfurled above and her right hand is outstretched holding a Dharma Wheel. She has an eye in the palm of each hand. At the top left of the thangka is Lama Tsongkhapa in teaching mudra, who is the emanation of the Buddhas of wisdom, compassion and skilful means. His image attracts the positive energies of wealth, protection and harmony, while healing depression, fear, anger and destructive emotions. At the top right of the thangka is Buddha Shakyamuni, founder of Buddhism, in the earth-touching mudra. Dukkar grants powerful protection from over 60 classes of spirits, especially if one recites her mantra. It is said that prayer to Dukkar fortifies our body so strongly that spirits literally cannot invade. She is very healing and helps to strengthen the body against physical problems. Dukkar’s practice is also very effective for purifying the karma of being wrongly accused, such as in arguments or legal cases. She will be beneficial for those who travel often and who are exposed to risks and dangers daily. *Does not include traditional brocade frame.